We hope that your child never gets injured. But life sometimes comes with bumps and bruises. When that happens who do you trust? 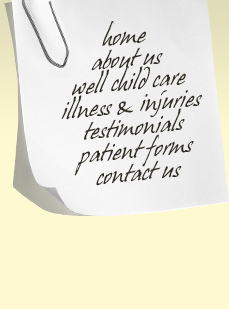 Dr. Jackson has been treating injured children for over 30 years. She worked for many years in emergency departments, at Children’s Hospital of Los Angeles and at All Children’s Hospital in St. Petersburg. So she has the experience to know what needs to be done. Many things can be treated right in the office. For example we can do stitches for cuts to save you a trip to the emergency department. Is it just a sprain or something more serious? Dr. Jackson will diagnose the problem and make sure you get proper care. Copyright 2008-2017 Danuta Jackson-Curtis, MD.